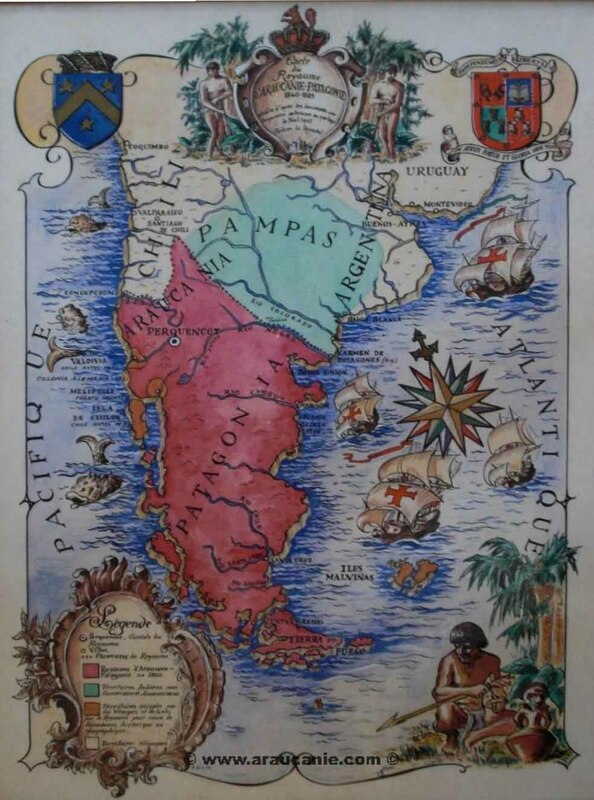 Sources: El Reino de Araucania y Patagonia by Armando Braun Menández (Editorial Francisco de Aguirre, Buenos Aires and Santiago de Chile). Includes various stamps, seals, decorations and shields of the monarchy. I believe that the green - blue - white flag was only hoisted by Oreille in Araucania for some weeks. Later the flag was changed in the exile of France and continues currently in use. I believe that the current arrengement was adopted later (in Europe) to make the flag heraldically correct. The info about the original flag can be found in articles by Lucien Philippe in The Flag Bulletin [tfb] and in the book El Reino de Araucania y Patagonia by Armando Braun Menéndez. The Strange Maps 321st blogpost shows a map of Kingdom of Araucania and Patagonia (1860-1862), as does also this Araucania.ORG webpage (large image); neither page gives detailed info about the map itself (date, etc.). At the top of the map two coats of arms can be seen, both visually unrelared to the flag; these probably the arms mentioned in Braun Menéndez’s book. and on a bordure engrailed Gules eight things Or. Warcry on scroll above the shield reading "Independencia y Libertad" (sic!) and Motto on scroll below the shield reading a Latin sentence. The coat of arms at the left consists of an ogival shield and a baron’s coronet: Azure a chevron Or between three five-pointed estoiles Or. 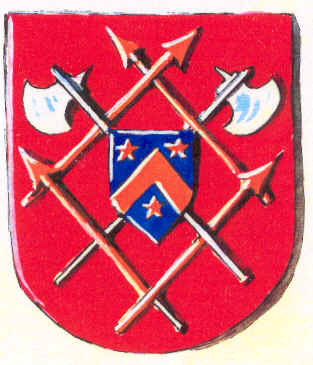 These arms at the Araucanie.COM website show as on inescutcheon, but in red instead of yellow, over two battle axes set in saltire within four spears set in lozenge; the main shield being red.